Orioles manager Brandon Hyde grew up a Giants fan in Santa Rosa, Calif., about 55 miles north of San Francisco where Frank Robinson was the manager of the major league club. Hyde met the Hall of Famer once as a kid and then again in Puerto Rico during a series between the Florida Marlins and New York Mets. Hyde was coaching with the Marlins. "He walked into the office and there was some serious presence there," Hyde said. "I had a ball and made sure to have him sign it." Those interactions made "A Celebration of Frank" at Camden Yards April 6 all the more poignant for the Orioles' skipper. "It's a big night and I understand how important he is not only to the game of baseball but what he meant to the fans and community in the Baltimore area," Hyde said. "He wore so many different hats and did so many things well. He's one of the greatest players of all time. I wish I had more time to spend with him." Robinson spent more than half a century in Major League Baseball as a player, coach, manager and front office executive. He was a two-time MVP, 14-time All-Star and two-time World Series champion. He spent six years with the Orioles, winning a pair of World Series in 1966 and 1970 and the Triple Crown in 1966. Robison was also the first African American manager in major league history in 1975 and was an advocate of civil rights issues throughout his entire career. Robinson remains the only person in Orioles history to serve as a player, coach, manager and front office executive. 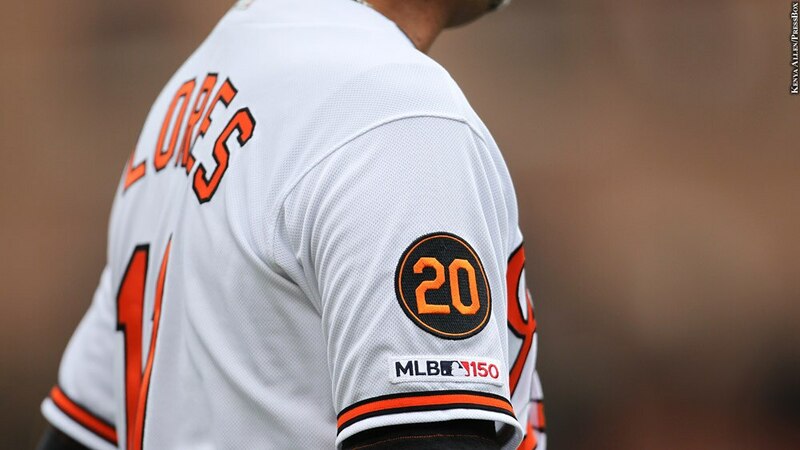 The Orioles players are wearing a commemorative "20" patch on their jerseys in honor of Robinson, who died Feb. 7 at the age of 83 after a long illness. Acting Baltimore City Mayor Jack Young proclaimed April 6, 2019 as "Frank Robinson Day" in Baltimore City. At the ceremony, Robinson was also honored by Orioles legends Brooks Robinson, Jim Palmer and Boog Powell. National Baseball Hall of Fame and Museum President Jeff Idelson also spoke. Cal Ripken Jr. and Eddie Murray were in attendance. Palmer remembered Robinson hitting a long fly ball at Fenway Park that appeared to be a sure home run. Instead, the ball bounced off the wall and Robinson was held to a single because he didn't run. After the game, Robinson left a note on manager Earl Weaver's desk that read, "I embarrassed this ball club. I embarrassed myself. It will never happen again," along with a couple of one-hundred dollar bills. "That's what Frank Robinson was all about," Palmer said. "Frank Robinson was one of the greatest players that ever played and cannot tell you how fortunate and how proud I am to not only be his teammate, but his dear friend." Powell was teammates with Robinson in Baltimore and also played for him in Cleveland. After Powell retired and opened his iconic barbecue stand, Robinson was working for the Orioles. Robinson once leaned out of his office window and asked Powell to toss him a pit beef sandwich. Powell obliged. Moments later, Robinson threw the sandwich back. "No barbeque sauce!" Robinson told Powell. "It was an honor and privilege to play with Frank, but most of all, to be his friend," Powell said. Brooks Robinson remembered going on the road and local photographers wanted to take a picture of the "Robinson brothers." They quickly learned the teammates were not actually brothers, but either Frank or Brooks would say, "We're not brothers. We're just cousins." Robinson admitted he shed a few tears this week. He and Palmer attended a memorial service for Robinson in California that was attended by NBA greats Bill Russell, Magic Johns and Kareem Abdul-Jabbar. "As far as greatness is concerned, he is in an elite class," Brooks Robinson said. "Just like [Mickey] Mantle, [Willie] Mays and [Hank] Aaron, he could do it all." In addition, portions of 33rd Street, the former home of Memorial Stadium, were renamed Frank Robinson Way. The Orioles Charitable Foundation is honoring Robinson by donating a total of $60,000 to several civil rights and African American museums, including the Reginald F. Lewis Museum of African American History & Culture in Baltimore, the National Civil Rights Museum in Memphis, Tenn., and the National Museum of African American History & Culture in Washington.